2017-2018 school enrollment is open for the Elementary Class (grades 2-4) and our Younger Class--Preschool through 1st grades. Class size for both classes is intentionally limited to 12 students, so get your applications in early, as we expect a large majority of children to return. Fire Mountain's Elementary Program (grades 2-4) is a mixed age model that facilitates in-class mentoring and unique learning opportunities. Students are challenged with a program that integrates the building blocks of academics while having the advantage of bringing the outdoors into the classroom, and vice versa.. FMS teachers guide children in core routines that bring them into contact with nature and foster their understanding, awareness and appreciation of the flora and fauna of our environment. The school's proximity to Oswald State Park and the Cape Falcon Marine Preserve is an excellent laboratory for this endeavor. The Fire Mountain Young Class program for children 4 to 6 +years old has always been structured with the belief that children learn primarily through their need to be active and their uncanny abilities to imitate all that surrounds them. As always with FMS, nature plays an integral part in the school day. 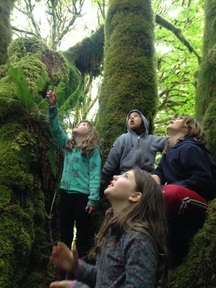 Children spend ample time outdoors exploring, climbing on play structures, swinging towards the treetops and clambering up and into the woods, teachers in tow. They work on the building blocks of literacy, math and science through the natural lens which surrounds them. We are a community of mutual support, where teachers and staff are attentive to students’ emotional needs as well as their academic needs. Parents will be expected to provide friendly encouragement to every student, much as they would be encouraging to the children in their own family. Each involves group meetings with students to outline overarching goals for the week, to address any student questions or concerns, and respectfully settle any disputes. Through this process, students will gain emotional security and maturity, and will develop a vocabulary for expressing thoughts and feelings. Alongside the core curriculum, this will help the school meet its ultimate goal of helping students to become well-rounded, conscientious individuals, with a firm social and academic foundation that will aid them through all future phases of their lives.